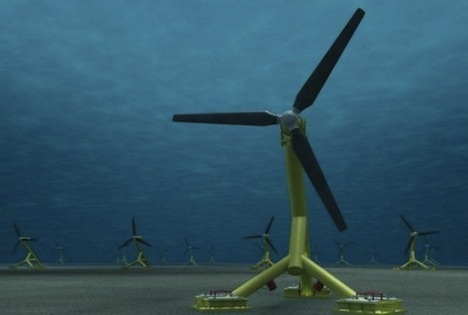 Tidal farms, an underwater wind turbine–like system using the ocean’s power to create electricity, are an increasingly popular talking point for nations looking to clean up their energy act in the coming years. Scotland has now reached a major milestone in the emerging energy field, successfully installing its first 1 megawatt tidal power turbine off the coast of Orkney in the Sound of Islay. The underwater turbine is 100 feet-tall. Tests were conducted to see how well electricity would generate for surrounding areas. According to Scottish Power Renewables, the company overseeing the project, the turbine was performing well and has been powering homes and businesses on the island of Eday. Despite the fact that the turbine was lowered during a severe storm in rocky, harsh waters, the success will likely pave the way for future tidal farms. You can watch a video of the installation here. The turbine has the ability to generate one year’s worth of power for 500 homes. After this successful stage a timetable will be developed for further development, and construction will wrap up by 2015. It will be very interesting to see how this goes, and how it improves power in the region.